Day 14: May 10, 2015. Our last day. We woke up this morning back in Istanbul. We have to quickly put the last things in our suitcases, get breakfast, then catch the bus to the airport. 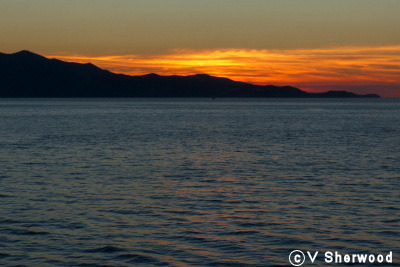 It will be sad to leave the Aegean Odyssey, our home for the last 2 weeks. Below are some photos of the ship. 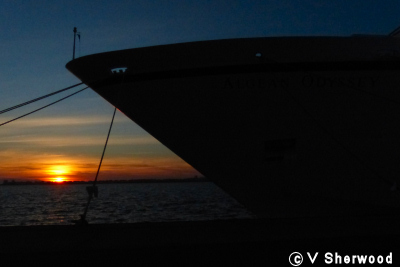 Cruising is a super way to travel - a different port every day but you don't have to pack up every day as the "hotel" goes with us. 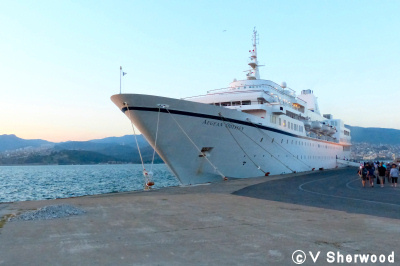 We enjoyed our cruise so much that we have booked another cruise to Spain, Sicily and Italy on the Aegean Odyssey, of course. 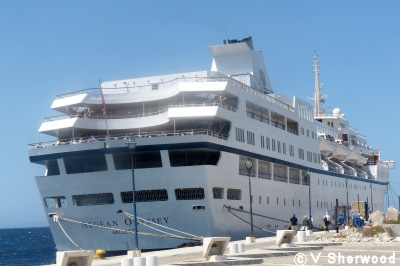 Our ship, the Aegean Odyssey. 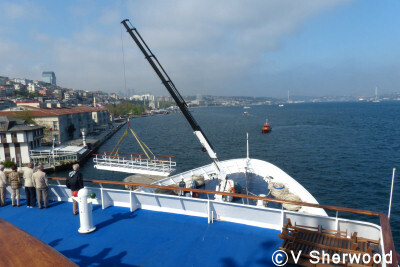 We had just boarded the ship in Isanbul 2 weeks ago and they were taking in the gangplank. 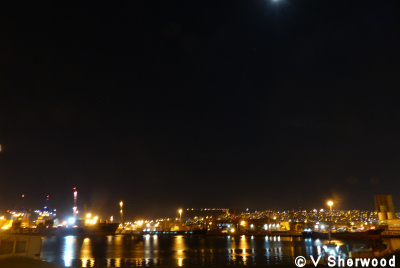 Our ship docked in Izmir. We had just returned from Ephasus and the sun was setting. When leaving the ship for an excursion, we were given a bottle of water. On our return, we were met with damp towls to wash our faces and hands and a glass of iced tea. This is indeed service! It was good to be "home". And it was feeling like home - the crew were so friendly and helpful; everything was so well organized. 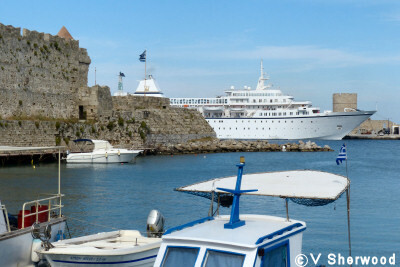 The Aegean Odyssey docked in Rhodes harbour. Because it is a small ship, about 350 passengers, it can dock right in the harbour. That meant that we could visit the ports and walk around the town, if there was spare time before or after an excursion. 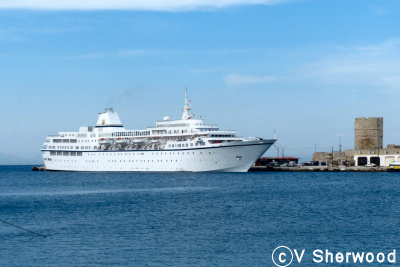 The Aegean Odyssey docked in Mykonos. This is the stern of the ship. Above the black line is the Terrace Cafe. 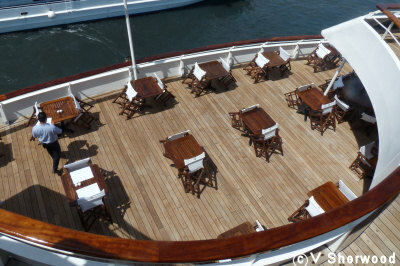 The rear part is open deck - lovely to sit outside enjoying dinner and a glass of wine and watch a glorious sunset. The Terrace Cafe from above. This was our favourite place to eat as we had some really super sunsets. 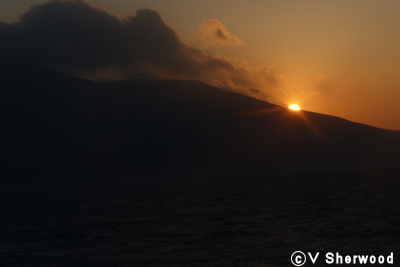 Sunset as we sailed away from Crete. 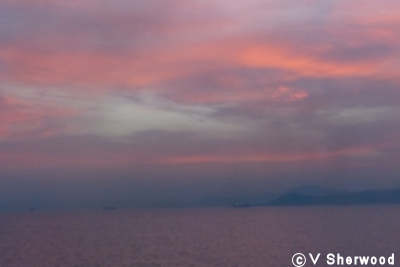 Sunset as we left Athens.